Does this quilt look familiar? 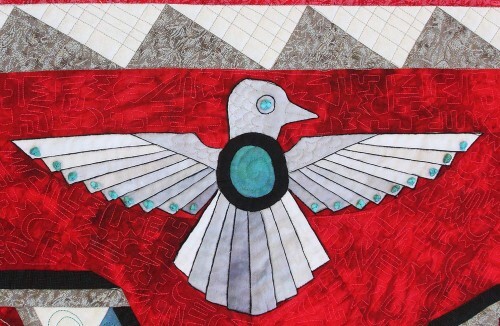 I designed this in 2011 for our annual Hawks Aloft raffle quilt. It was a huge success – we sold more raffle tickets than ever before. But I loved this quilt so much, I had to make another one! 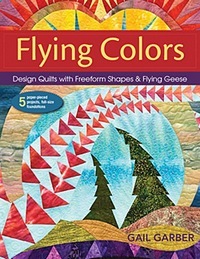 This new and improved version was made with the help of Donna Barnitz and Michele Hymel, to be a competition quilt. It has been accepted into the AQS Show in Paducah and will be exhibited there April 25-28, 2012. And lucky me, I’ll be teaching there and will get to see it hanging in the show. 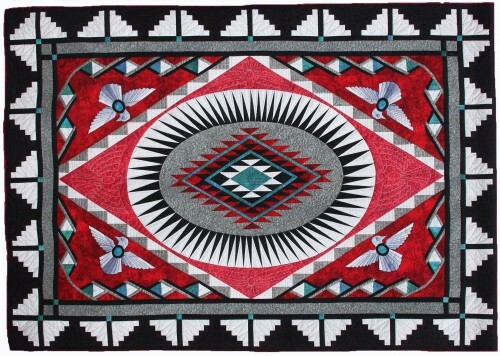 The design is by yours truly and inspired by my fascination with Navajo rugs. Abo Canyon is about 60 miles southeast of Albuquerque, NM and is the steepest grade on the BNSF Railway route through New Mexico. The scenery is just gorgeous. Here’s a close-up of one of the Thunderbirds that are in each corner. Thanks to Donna and Michele! Stunning!! Any chance of a pattern being published yet?